Cessna plane soon after Thursday's crash at Centralia Municipal Airport. 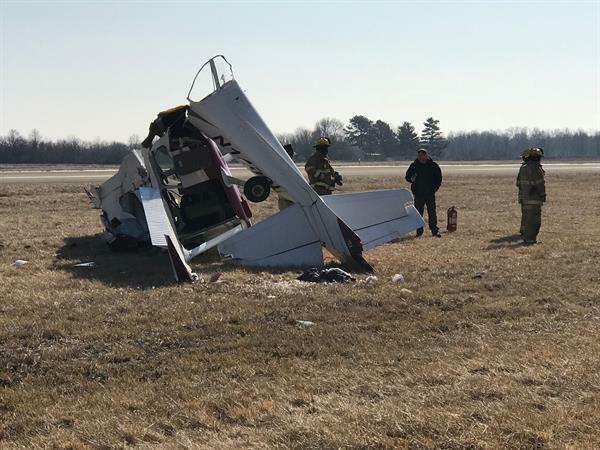 A Cessna four-seat one-engine plane crashed while attempting to lift off at the Centralia Municipal Airport Thursday morning. WJBD Radio reports the Federal Aviation Administration, which is handling the investigation, indicated the aircraft stalled when attempting to depart the airport and crashed on airport property. Centralia Police Chief Brian Atchison says the only person in the plane was the pilot. He appeared to have sustained head and leg injuries and possible internal injuries. The pilot was a student being trained by Airgo, which is the registered owner of the aircraft. Officials say the full investigation will take several weeks to complete. A plane crashed Thursday morning at the Centralia Municipal Airport. WJBD Radio reports Centralia Police Chief Brian Atchison says the only person in the plane was the pilot and he was taken to SSM Health St. Mary's Hospital for treatment of injuries.